For this weblog entry, I decided to share some of the research I have been collecting for my final project on connecting Aboriginal knowledge and the BC math curriculum. Of particular interest to me, is creating cultural and meaningful contexts when teaching Mathematics, with the intention that the learners will develop a personal connection and relevance to the learning. Teaching Mathematics in a First Peoples Context is a resource written and published by the First Nations Education Steering Committee. It is a resource targeted for educators teaching the grade 8 and 9 curriculum. 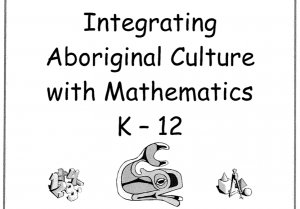 The targeted lesson plans reflect the First Peoples Principles of Learning while promoting engagement and inclusiveness of aboriginal culture in the area of Mathematics. Of particular interest to me, is the explanation and description of the pedagogy and principles of the Math First Peoples which is an extension to the First Peoples Principles of Learning. 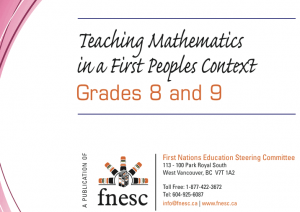 The First Peoples Principles of Mathematical Teaching specifies how teachers should implement the First Peoples Principles of Learning in the area of Mathematics. 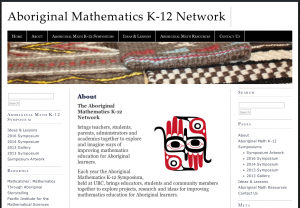 The Aboriginal Mathematics K-12 Network is a web gathering space where teachers, students, parents and academics share and investigate ideas on how to improve mathematics learning for Aboriginal students. Within this webspace is a connection to the Aboriginal Math Symposiums which is a gathering held annually where students, educators and community members join together to discuss how Mathematics can be connected to Aboriginal students in more meaningful ways. Various Universities have created websites for sharing Aboriginal Education content. The UBC library website has a link to lesson plans and other portals organized by subject area, including Aboriginal Education. A link from the University of Toronto website, connects viewers to resources and lesson plans from the webpage titled, Deepening Knowledge: Resources for and about Aboriginal Education. Here, students and teachers are able to access resources, tools and lesson plans that fuse Aboriginal Education with various subject areas. A sample lesson plan from this site includes: Haida Legends: Culturally Responsive Mathematics. Various districts across Canada have also created their own collection of resources for teachers and students to use around Math content. The Port Alberni School District (SD70) for example, have created a resource called Integrating Aboriginal Culture With Mathematics K-12. Although this resource was developed with curriculum that is now outdated, the concepts and ideas of using various Aboriginal artifacts and contexts are highly valuable. The project that initiated this document centred around the creation of a button blanket, and various mathematical concepts from various grade levels reflected each step of the process of its creation. 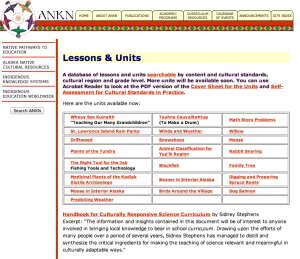 The Alaskan Native Knowledge Network is a great site which includes various resources which contextualize Aboriginal Education and Mathematics. This site includes a database searchable by content, cultural standards, cultural region, and grade level. 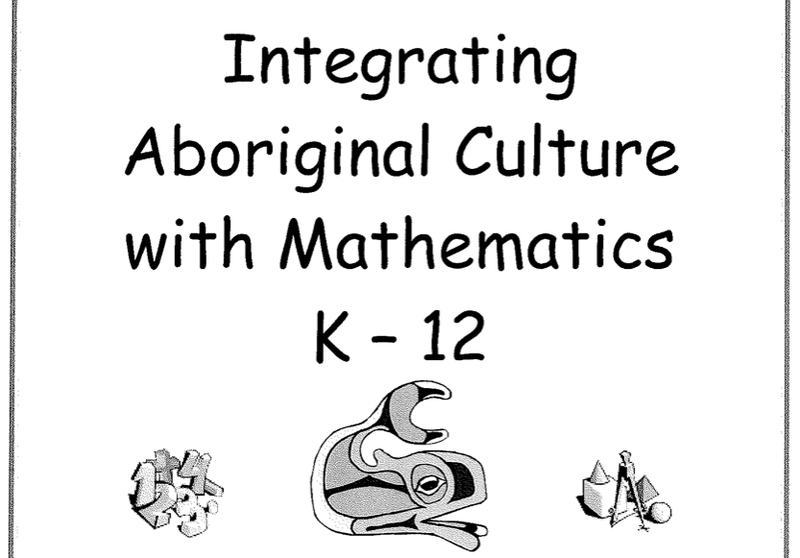 A example of a resource found on the site, which demonstrates the use of Aboriginal context when teaching Mathematics is called, Math In A Cultural Context. University of Alaska Fairbanks collaborated with Yup’ik elders, teachers, and Alaskan school districts to develop culturally based curricular materials. The resource consists of modules/teaching guides for grades 2-7 of various contexts such as berry picking, kayak building, and salmon fishing, which are accompanied with CDs, and DVDs, that demonstrate elder’s knowledge.